Egg tart also called egg custard tart, dan tat, dàn tǎ, dahn taht, dan that is a popular pastry in Hong Kong, as well as in Macau and mainland China. What is a Hong Kong egg tart? Egg tart is prepared with a pastry crust shell that is filled with an egg-based mixture. 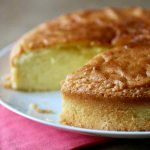 It is then baked to reach the consistency of custard or flan. Versions of this egg tart are popular in Portugal, Brazil, the UK as well as other Asian countries. What is the origin of egg tart? During the 1940s and throughout the 1950s, Hong Kong’s industrial development resulted in a large flow of immigrants from mainland China. With this immigration, new types of food as well as cuisines were introduced to Hong Kong. With the island being a British colony for more than 100 years at the time, the primary cuisine had been Cantonese Chinese with Western cuisine influences. 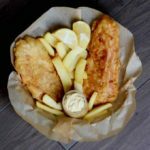 Traditional Hong Kong cafes that sell this Western and Chinese fusion cuisine at low prices are part of Hong Kong’s identity. They are called cha chaan tengs. It is actually in these cafes that egg tarts were introduced to the British colony via the Portuguese colony of Macau, mostly to accompany afternoon tea. 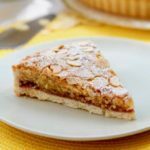 This is actually the best time to get those tarts, as bakeries make fresh hot batches in time for the afternoon tea tradition. In Portugal, similar egg tarts are called pasteis de nata. 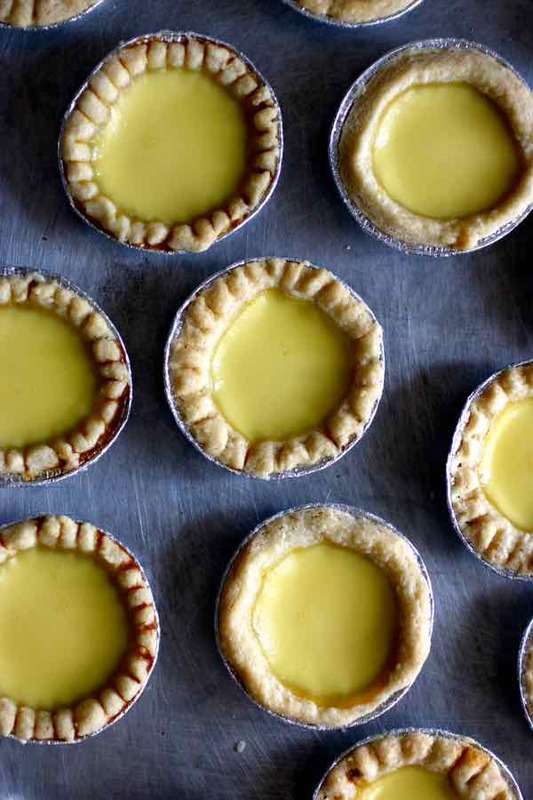 However, egg tart also shares its origins with the English custard tart. Hong Kong egg tarts are however filled with a rich custard that is much eggier and less creamy than English custard tarts. 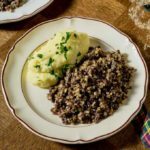 Also, dan tat is served piping hot and is not sprinkled with ground nutmeg or cinnamon before serving, like pastel de nata or English custard tart. 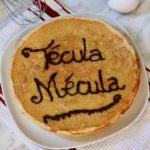 The Portuguese egg tart version, immortalized by Casa Pastéis de Belém which was the first pastry shop outside of the convent where they were created, to sell this pastry in 1837, has a very recognizable scorched top, very similar to a creme brulee. The Hong Kong style egg tart has a top that is more glassy and smooth. 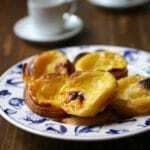 This is why pastéis de nata taste like slightly burnt sweet caramel and are more golden brown or sometimes scorched on top, where the Hong Kong tarts have more of a pure egg yolk taste. The resulting Cantonese egg tart, also called dahn taht, has since become ubiquitous with Chinese bakeries as well as dim sum houses. Famous bakery Tai Cheong Bakery in Hong Kong is now synonymous with the emblematic egg tart. The bakery that has been opened since 1954, sells more than 3,000 tarts everyday in each of their twelve locations. In Hong Kong, there are really two main versions of these egg tarts: one with puff pastry (酥皮底), the other one with shortcrust pastry (牛油皮底). I decided to make the tart version with shortcrust pastry, as well as butter although a number of traditional recipes call for lard. In Guangzhou (formerly known as Canton), egg tarts are now one of the most iconic dim sum dishes offered in dim sum houses. 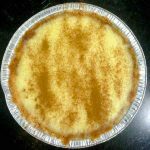 You can order 3 types of these tarts: dan tat (egg tart), pastel de nata (also called Portuguese tart), or coconut tart. I prepared these egg custard tarts on a rainy afternoon in Los Angeles a few days after our New Year’s Eve feast. The kids and I enjoyed them with a glass of milk, as soon as they came out of the oven. Silky and smooth to perfection! 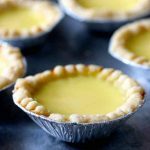 Egg tart or dan tat is a delicious Hong Kong egg custard-based pastry that probably originated from Portuguese pastel de nata and English custard tart. In a large bowl, add the flour, salt, and 1 tablespoon of sugar. Mix in butter with a fork until it is in small crumbs. Add 2 tablespoons of cold water (or a little more) to bring the dough together. Cover the dough and refrigerate for 20 minutes. Place the dough onto a lightly floured working surface. Slightly knead and roll the dough with a rolling pin to form an 8 x 20 inch rectangle. Fold the top third of the dough down to the center, then the bottom third up and over the remaining dough to form a square. Give the dough a quarter turn and roll out the dough again to obtain a rectangle. Fold the same way as in the prior step. Cover, and refrigerate for 30 minutes. Whisk the eggs and evaporated milk. Then incorporate the sugar water, vanilla and continue to whisk. Strain the mixture through a fine sieve. Roll out the dough to a thickness of about ¼ inch. Cut circles the size of your tart molds. Press the dough into the molds all the way up to the edges. 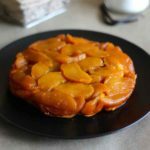 Place the tart molds on a baking sheet. Fill each empty pastry shell almost to the top. Transfer the baking sheet to the oven and bake for 15 minutes. Then, reduce the temperature to 350 F and bake for another 12 minutes, until the custard is set. Leave the oven door ajar for 5 more minutes before removing the egg tarts from the oven. Enjoy the egg tarts piping hot. 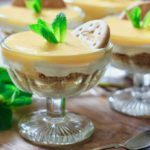 I’m wondering if this is the same thing as a similar custard I’ve found in some Chinese buffets that is baked in phyllo cups. 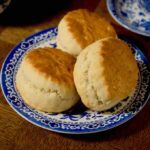 They are served warm and are so delicious. Puff pastry is not the same as phyllo dough. Phyllo is very thin and crispy. Puff pastry is . . . well, puffy. They place several squares of phyllo into little cups, then fill with the custard and bake. The pastry that is hanging over the edge of the custard gets browned and brittle, because it’s paper thin. It’s the same pastry sheets used in Greek baklava or tiropitakia, those little cheese filled triangles. After doing a bit of research on internet, I think they are probably the same thing, just using a different pastry base. 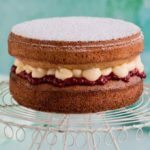 However, your recipe has lots of flour in it so I’m pretty sure yours is much more dense in texture than the ones I had. Mine were a very delicate egg custard which would have NO flour, and yours look more dense than that. 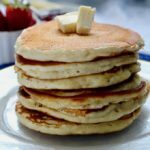 It’s making me hungry for some of these though. Maybe I’ll have to break down and just make them and see how they turn out. I do like puff pastry myself. Thanks for your post, I enjoyed it. Made it for breakfast, delicious. 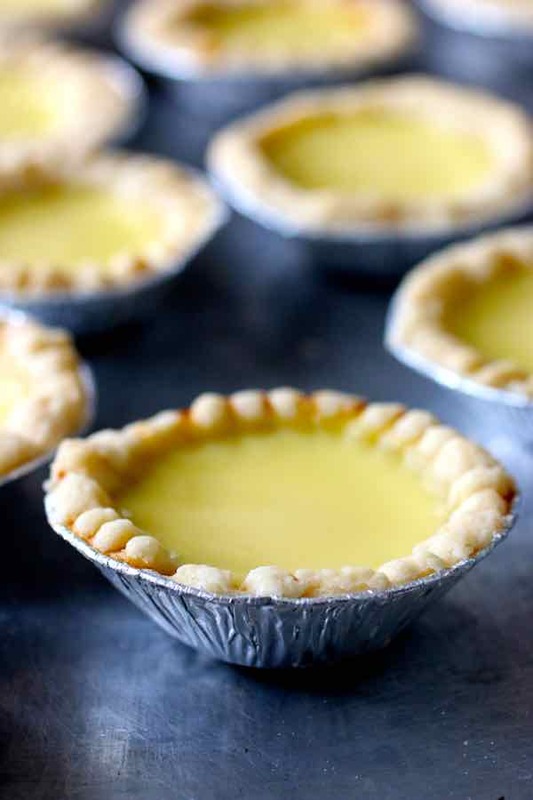 I actually used prebought unbaked mini pie tart shells and simply filled them. Fantastic. hi mike. Do you think I could add a dollop of pumpkin purée to the custard, as a variation for thanksgiving? Anything you’d adjust to compensate? 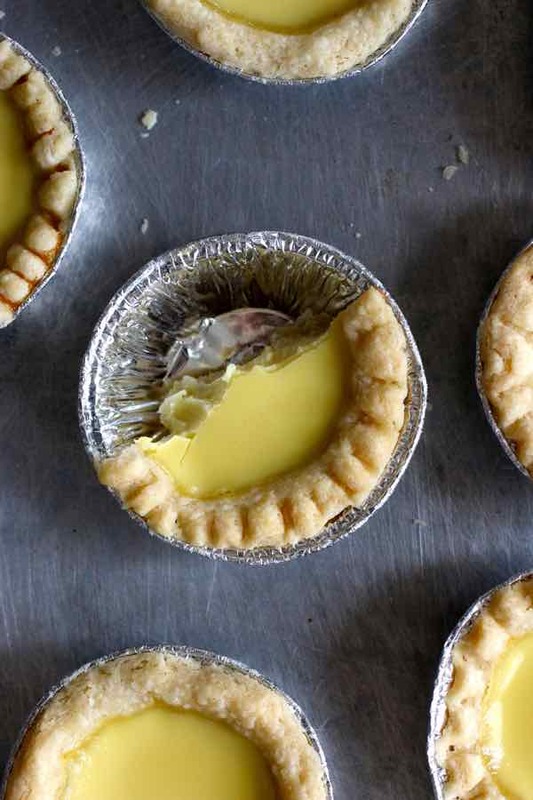 Thanks so much — I just bought egg tart tins on a trip to Singapore and can’t wait to use them. Hey Elissa, sure, why not 😉 Never tried and not sure of the result. I think you can go ahead with the same measurements if you’re not ading too much pumpkin puree. Happy Thanksgiving!